The Abyss is a location in Dark Souls and Dark Souls Remastered. A dark and formless void, in an already dark and sad world. It's accessed via the New Londo Ruins after you lower the water level. It serves as the arena for the Four Kings boss battle and, once they're defeated, is also the home to Darkstalker Kaathe, the leader of the Darkwraith Convenant. To reach fog gate that leads to the The Abyss you will have to have lowered the water level in New Londo Ruins. 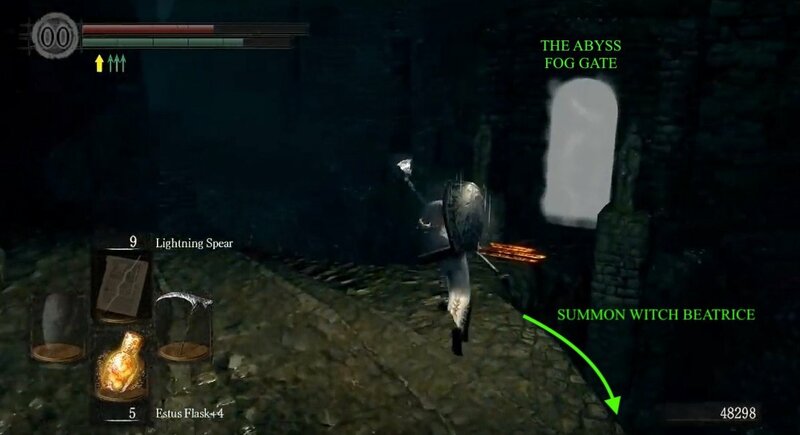 For further details on how to reach the fog gate that leads to The Abyss, please refer to the New Londo Ruins walkthrough. If you plan to enter The Abyss and have any chance of surviving, it's an absolute must to have the Covenant of Artorias Ring, you got from killing the Great Grey Wolf Sif in Darkroot Garden, equipped. Once you reach the fog gate, it's worth knowing that there is a summon sign for an NPC nearby - Witch Beatrice - who can help you with the Four Kings boss fight. The sign will only appear if you are in human form and only if you already summoned her help for the Moonlight Butterflyboss in Darkroot Garden. To find her sign, look for a large pillar to your right when looking at the fog gate - you'll find her sign around the otherside of the pillar. It's a good idea to kill the Darkwraith in the area prior to summoning her. 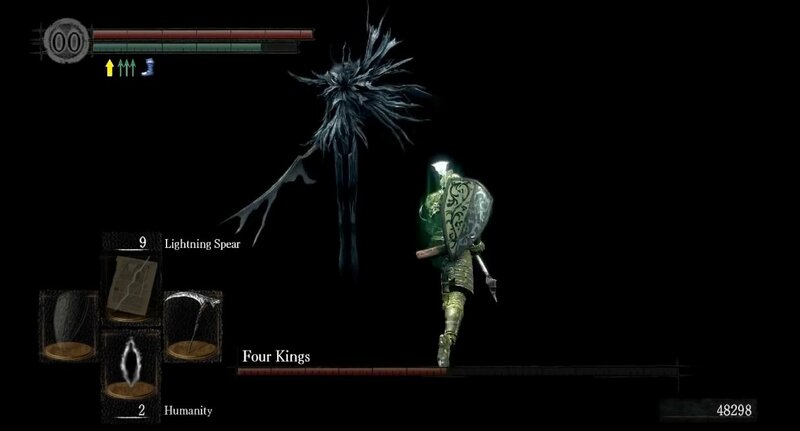 After you kill the Four Kings, you may remove the Covenant of Artorias anymore; however if you were to battle the Four Kings fight in other players' worlds, you would still need it. At the death of the Four Kings, you will acquire the Bequeathed Lord Soul Shard and a bonfire will appear in his place - this bonfire will let you warp, even if you do not have the Lordvessel yet. If you have the Lordvessel though and didn't go to Kingseeker Frampt in Firelink Shrine with it, then will see Darkstalker Kaathe beside the bonfire. He'll take you to the Firelink Alter to place the Lordvessel and will also allow you enter the Darkwraith covenant - read up on this covenant to decide if you want to join. NOTE: Be aware that placing the Lordvessel with Kaathe will anger Frampt, and you will no longer be able to avail of his services for this playthrough. Once you're done here the next stop is The Duke's Archives, so warp to the 'Anor Londo' bonfire to continue the main quest. Offers you entry into the Darkwraith Covenant. Transports you to the Firelink Altar to place the Lordvessel and unlock the Golden Fog Gates. Sells Cracked Red Eye Orbs. "Why are you searching for the sun in the abyss?" do you still need the ring to go to the abyss after you&apos;ve defeated the four kings?